If it’s true that the way to man’s heart is through his stomach, well this dish will send him over the moon. Not much can beat a tender filet mignon steak, topped with a savory mushroom mixture, and wrapped in a flaky puff pastry crust. Swoon. 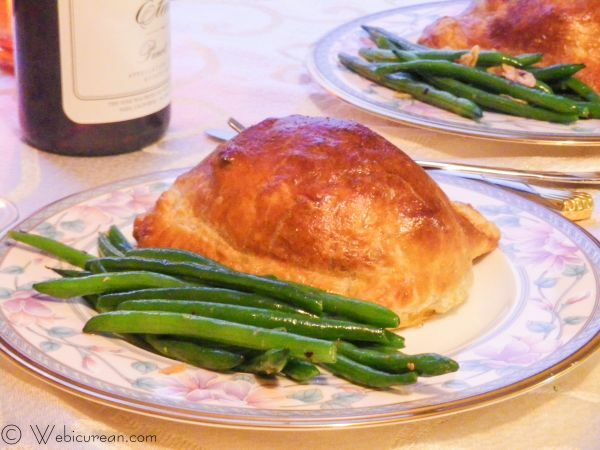 The funny thing is I’ve always thought of Beef Wellington as a fussy, overcomplicated dish, so what a pleasant surprise it was to discover a version that’s easy enough to whip up after work. For some, this delectable dish is a relic from a bygone era. Which era is uncertain. 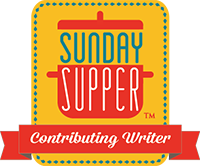 While food historians tend to agree that it’s named for Arthur Wellesley, First Duke of Wellington, and the fellow who crushed Napoleon at Waterloo, it didn’t appear in print until 1940’s The Palmer House Cookbook, despite being typical of the sort of meal prepared during the good Duke’s time. Typically the filet would be topped with pÃ¢tÃ© de fois gras and duxelles of mushrooms before being wrapped in puff pastry. It surged in popularity in the 1960s when super competitive home cooks wanted to pull out all the stops to wow their guests. Of course, my particular obsession with Beef Wellington is all Gordon Ramsey’s fault. After watching plate after luscious plate being served up in Hell’s Kitchen, I could no longer resist. He’s probably forging a comeback for Wellington, but what restaurants around here serve it? And would it be the same if the head chef isn’t yelling “you stupid donkey!” in the background? Then my friend Liz mentioned she had a super easy recipe we could try at home. I should have known. Liz is a master at pulling off fancy fare that’s delicious yet much easier to prepare than you’d imagine. Thank Liz for this one. 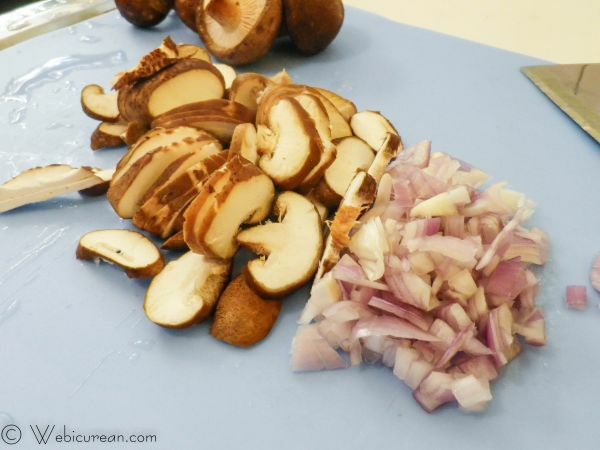 Start by mincing the shallot and slicing up the mushrooms thin. 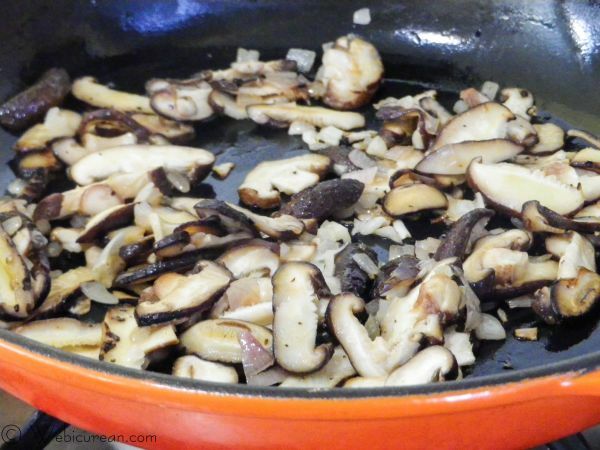 SautÃ© the mushrooms and shallots in the olive oil until the mushrooms are cooked through. Set this mixture aside. Meanwhile roll out the puff pastry into a square. Cut in half, then place on a baking sheet lined with parchment paper. Salt and pepper the steaks, then sear on all sides over medium high heat. Place each seared steak on one half of the puff pastry dough. Divide mushroom mixture and place on top. Fold the puff pastry over each steak, sealing the edges. Then brush generously with the beaten egg. Bake for 20 minutes, then pull out of the oven and serve immediately. Goes great with some green beans and a nice bottle of wine! 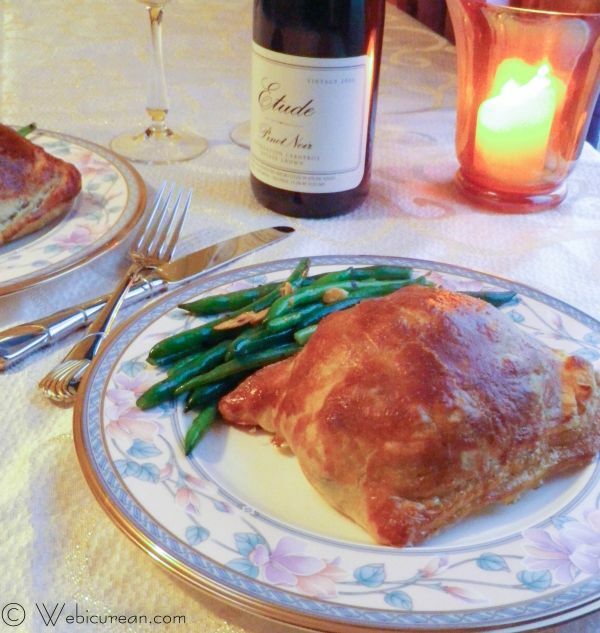 A tender filet mignon steak is topped with a savory mushroom mixture and wrapped in a flaky puff pastry crust. Saute the mushrooms and shallots in the olive oil until mushrooms are cooked. 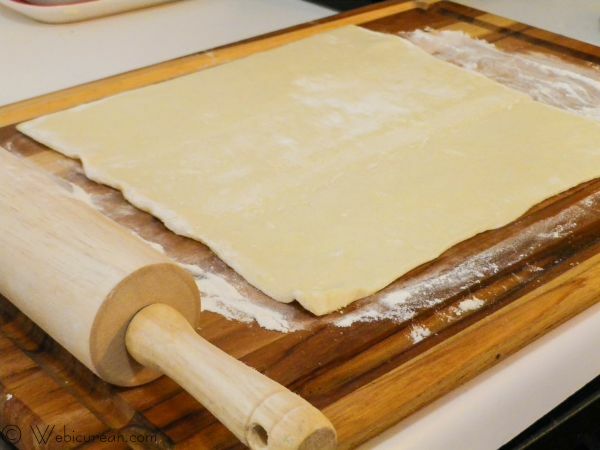 Lightly flour a large board, and roll out pastry dough until square. Cut in half. Transfer to a baking sheet lined with parchment paper. 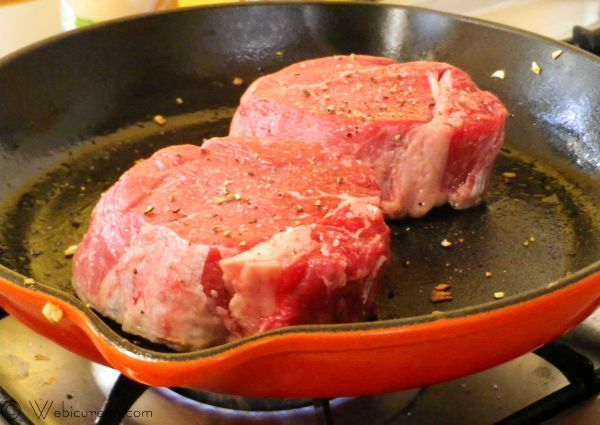 Salt and pepper the steaks, then over medium high heat, sear the steaks on all sides. 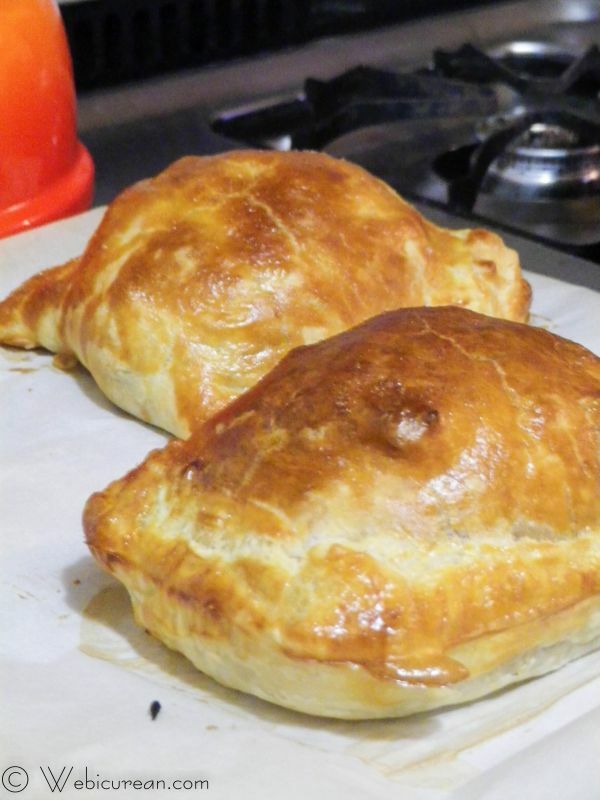 Place a seared steak on each half of the puff pastry dough. Top with mushroom mixture. 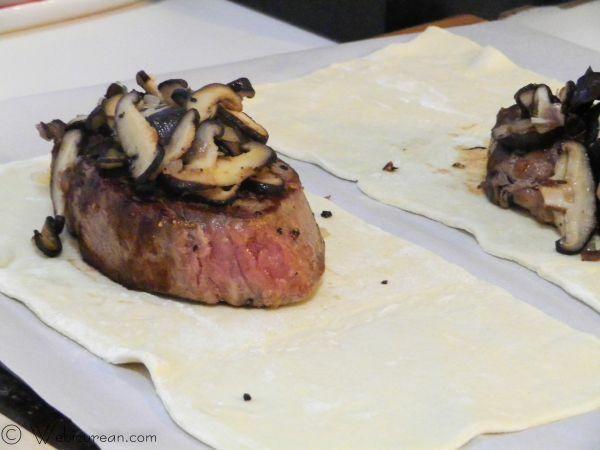 Fold pastry dough over the steak, folding over the edges to seal it. Press the edges down with a fork to make decorate. 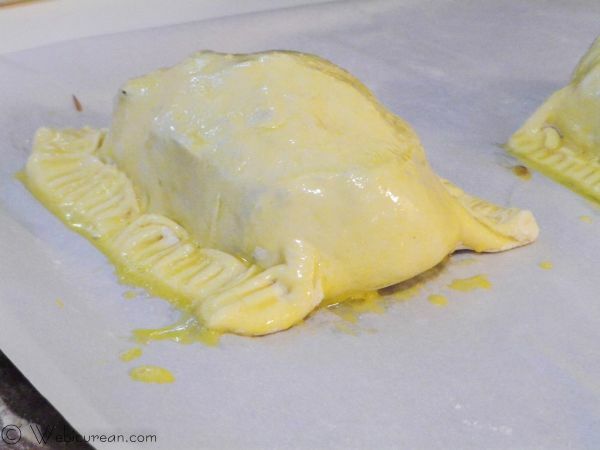 Brush egg generously over each wellington. Bake 20 min. uncovered. Serve immediately. 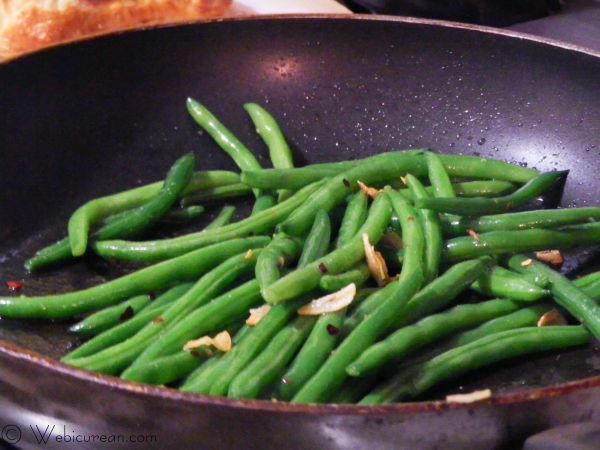 Green beans are blanched then tossed with olive oil, slivered garlic and crushed red pepper. Blanch green beans in boiling water for about 2 minutes. Drain. In a large saute garlic and crushed red pepper in the olive oil until garlic starts to brown. These look delish! I can’t wait to try this easy version. Ron & the boys love Beef Wellington.